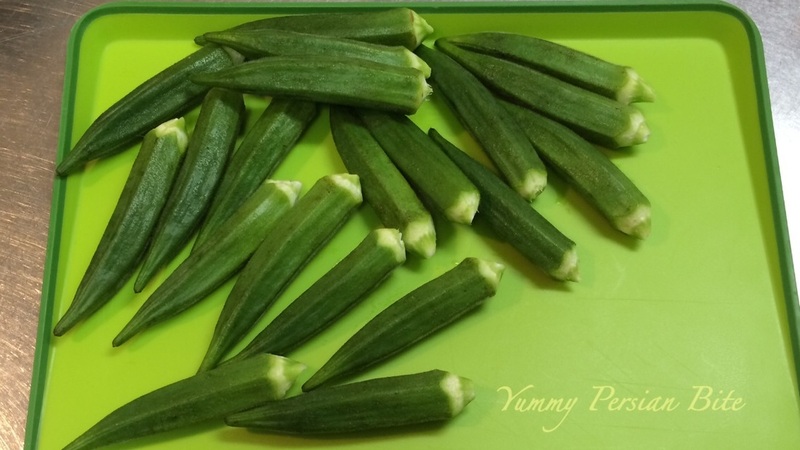 - Cut the stem of Okras but do not cut the bases. - 4 cups of boiling water. 1. Pour oil into the cooking pot and fry the onion until slightly golden. Add salt, black pepper, turmeric, garlic and mix thoroughly. 2. Add the meat and stir until they are brown on all sides. 3. Add the tomato paste, mix and fry for 1-2 minutes. Add boiling water, cover with the lid and cook over medium low heat for 45 minutes. 4. Add the okras and potatoes and cook for another 15 minutes. Take care not to overcook the okras so that they do not become slippery. 5. Add the lemon juice, adjust the seasoning and cook for another 2-3 minutes. Khoresht Baamieh is served with Chelow “White Rice”.